The Prestige auction programme at Manheim Auctions, Bruntingthorpe gets into full tomorrow with some exciting classic models set to join them in a mouth-watering catalogue. A 1970 Jaguar E-type will be competing for bids with a 2008 Rolls-Royce Phantom Drophead Coupe, while other stunners include a 2008 Aston Martin DBS, a 2007 Lamborghini Gallardo Spyder and a 2007 Maserati Quattroporte. Zaiga Jinkinson, Auction Centre Manager said: "We are privileged to be able to offer a range of such quality. This gives us a great opportunity to showcase our unique proposition to specialist vendors and buyers, who are attending in ever increasing numbers. Prestige auctions have been gathering momentum over the last few months with product such as last month's 2007 Maybach, which fetched £116,900, really capturing the imagination. 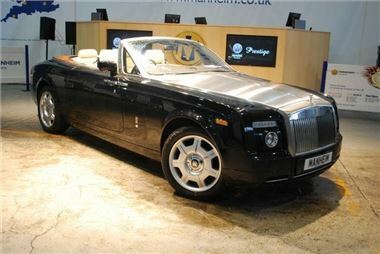 I am hopeful that the Rolls-Royce Phantom Drophead Coupe will attract some record bidding next week." Prestige Auctions at Bruntingthorpe take place at 10:00am every 2 weeks on a Wednesday prior to the weekly fleet sale. Manheim Auctions, Bruntingthorpe is located off J20 of the M1. More information is available at www.manheimremarketing.co.uk.